Giants have emerged from their strongholds to threaten civilization as never before! Hill giants are stealing grain and livestock, stone giants have been scouring settlements, fire giants are press-ganging the smallfolk into the desert, and frost giant longships have been pillaging along the Sword Coast. Even the elusive cloud giants have been witnessed, their wondrous floating cities appearing above Waterdeep and Baldur's Gate. Where is the storm giant King Hekaton, who is tasked with keeping order among the giants? The only chance at survival is for the small folk of the Sword Coast to work together to investigate this invasion and harness the power of rune magic, the giants' weapon against their ancient enemy the dragons. 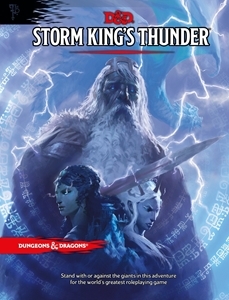 A Dungeons & Dragons adventure designed for characters level 1-11, Storm King's Thunder provides everything a Dungeon Master needs to create an exciting and memorable play experience, including rune magic items, a new treasure option for characters.